It wasn't cranky engines, shiftless transmissions or funky infotainment systems that sunk Mercedes-Benz last week in the Consumer Reports Car Brand Report Cards. Several of Mercedes' newer vehicles, including the front-wheel-drive CLA sedan, suffered a variety of problems with loose-fitting trim, rattles and other minor maladies. That knocked the German automaker from ninth place on last year's report to 21st this year out of 28 brands. It's important to note how the magazine defines reliable. "When we look at reliability, it includes anything that causes the consumer to return the car back to the dealership for repairs," said Jake Fisher, the organization's director of automotive testing. The report card combines reliability data from Consumer Reports testing and surveys from magazine subscribers. The organization called the CLA "unreliable" in a press release. Gripes mentioned by owners included one car with a broken door lock and another with an electronic stability control program that disabled itself five times, and the dealer couldn't fix it. Fisher said many CLA owners complained of squeaks and rattles; the sunroof was replaced in one owner's car. Mercedes-Benz spokesman Christian Bokich said the CLA, which went on sale in the United States in 2013, has had no major mechanical or electrical issues. It is the first fwd car that Mercedes has marketed in North America. The midsize sedan has exceeded Mercedes' sales expectations. The company sold 27,365 CLAs in the United States last year. The car starts at $32,425, including shipping. "The car was designed to attract new buyers to our brand, and it's continuing to exceed our expectations with its unique blend of aggressive style, attitude and value. Unfortunately, Consumer Reports ratings don't reflect what we're hearing and seeing in the marketplace," said Bokich. 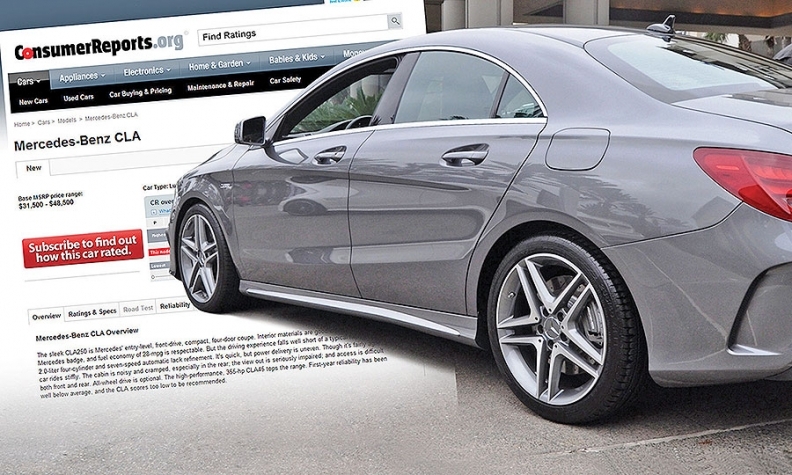 A scan of about 30 owners' comments at shopping site Cars.com indicated that most CLA buyers are happy with their cars. Some buyers had issues with interior room or figuring out how to work various features, but few complaints involved broken parts or mechanical issues. Reviews on Edmunds.com, another auto shopping site, also were mostly positive. Fisher said fit-and-finish issues early in a car's life often foreshadow more serious problems that occur when the vehicle ages. Fisher said the Mercedes S-class line has had some of the same issues.